Retrofit Roofing – MCT Sheet Metal, Inc. Achieve greater cost efficiency by converting your current flat built-up roof system with a durable, light weight metal standing seam roof. 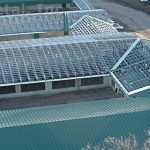 You will eliminate leakage and save maintenance cost with a beautifully fit and structurally sound roof system that also enhances the appearance of your building. This is especially beneficial for rental spaces and other income generating properties where it is essential to attract tenants and reduce maintenance cost. MCT’s Retro-Fit System converts an existing flat roof into a pitched, or sloped roof. The new roof sheds water easily and quickly. This eliminates standing water (and subsequent leakage) problems inherent in flat roof design. The retro-fit design uses light weight metal framing custom fabricated in MCT’s plant facilities and then installed at the project site. MCT builds the framing system, trusses and runners, using 20- or 22-gauge galvanized steel or galvalume. This framing design distributes the weight of the roof evenly over the entire building. This allows the MCT Retro-Fit system to be easily installed over wood, concrete, steel, or other structures. The resulting new “attic space” allows for low cost blanket insulation which, together with louvers and ridge vents, greatly reduces heating and cooling costs. 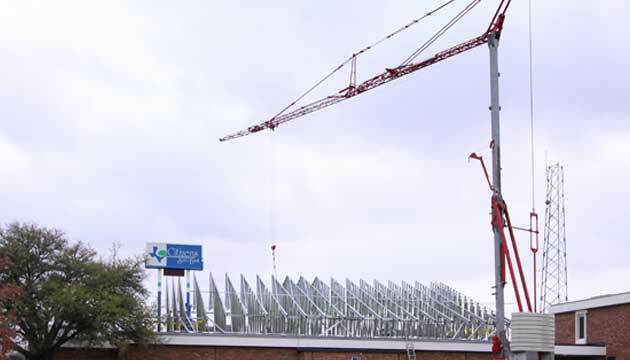 The final step in the MCT Retro-Fit process is installation of the “skin”, a 24-gauge galvanized or pretreated galvalume metal panels fabricated by MCT. These metal panels, available in a variety of attractive durable colors, are joined together using a strong watertight double-lock “standing seam” design which uses concealed clips. Consequently, the panel fasteners (clips) are not exposed and prone to weathering problems. This clip design is thermal-responsive and allows the standing seam metal roof to be a free floating system. 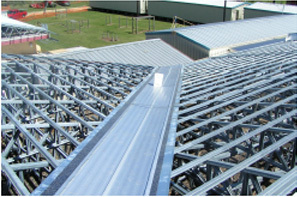 This MCT Retro-fit System design allows for adequate expansion and contraction which effectively removes the major cause of stress and leakage in a roof structure. The new MCT Retro-Fit roof delivers maximum protection against leakage while greatly enhancing overall appearance of your building. MCT Sheet Metal’s double lock standing seam roof system is manufactured from 24- gauge galvanized (G-90) steel of pretreated galvalume. The finish on the steel is Kynar 500 or Hylar 5000 color finish,a fluorocarbon coating. All coatings are applied on a continuous coil coating line which pre-treats the metal, applies primer coat, and then applies the finish coat.The film thickness of the panel’s top side is 0.70 to 0.90 mil over 0.25 to 0.30 mil prime coat. This provides a total top-side film thickness of 0.95 to 1.23 mil. The bottom side is coated with a primer with a dry film thickness of 0.25 mil. This combination provides the ultimate in metal protection. Download technical specs here. 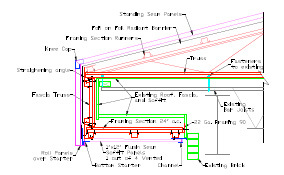 The standing seam system is installed using concealed clips- so there are no exposed fasteners (see diagrams). Elimination of exposed fasteners reduces and defers maintenance costs. 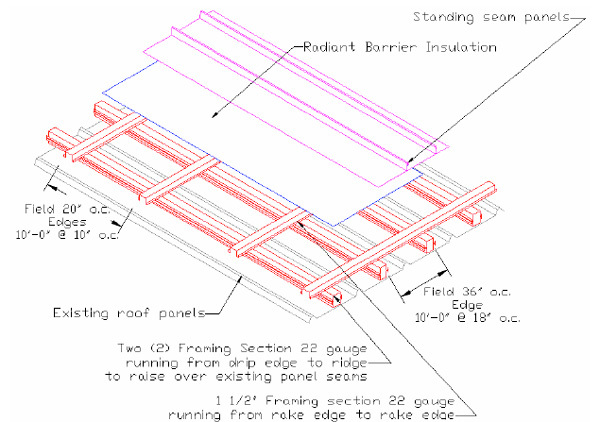 In addition, these clips are thermal-responsive allowing the standing seam design to be a free-floating system. This allows for contraction and expansion (thermal movement). Thermal movement is the major cause of stress and resulting leakage in a structure. Resolving this problem is a major feature of this particular roof system. Consequently, MCT’s color-coated, thermal-responsive, double lock standing seam roof design is the finest of exteriors, providing maximum protection against leakage while greatly enhancing overall appearance and trouble-free durability.